The project will demonstrate NET Power’s proprietary Allam Cycle technology. Graphic: courtesy of Toshiba. 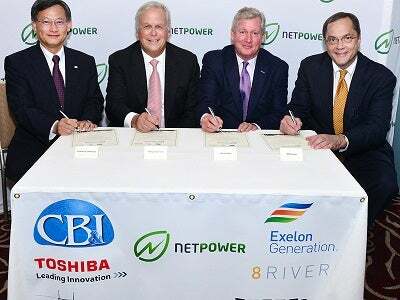 The project is being developed by NET Power, a joint venture (JV) between 8 Rivers Capital, Exelon Generation, and Chicago Bridge & Iron (CB&I). Photo: courtesy of Toshiba America. The construction of the pilot plant started in March 2016. Image courtesy of NET Power. Design works for the project commenced in 2010, project agreements between the JV partners were finalised in October 2014, construction works started in March 2016, and commissioning phase is anticipated to start in late-2016 and scheduled to be completed in 2017. The pilot plant is being constructed to demonstrate NET Power’s proprietary Allam Cycle technology. The fossil-fuelled power plant will have a design capacity of 25MW (50MWth), and the data from the project will be used to develop a larger 295MW (590MWth) commercial power plant. The project is estimated to require an investment of approximately $140m, which is being financed by Exelon and CB&I. Shaw Group, acquired by CB&I in 2013, provided a $50.4m grant for the project in 2012. During the same year, the project was also granted a £4.9m ($7.8m) grant from the UK Department of Energy and Climate Change as part of the £20m ($32m) Carbon Capture and Sequestration (CCS) Innovation Program Competition. The power plant will primarily be equipped with an air separation unit (ASU), a combustor, a turbine, heat exchangers, a cooling tower, and a water separator. The electrical output from the project will be conveyed to the grid. The project will deploy NET Power’s proprietary Allam Cycle technology, which uses supercritical carbon dioxide (CO2) as working fluid to drive a combustion turbine. The combustor is designed to handle a gas pressure of 300bar. The new turbine and combustor system has been under development since 2012 by Toshiba, and was successfully tested in August 2013. The technology integrates the oxy-combustion process, in which natural gas fuel is burned or combusted with pure oxygen to generate a high-pressure CO2, which is further used to drive a turbine to produce electricity. "The pilot plant is being constructed to demonstrate NET Power’s proprietary Allam Cycle technology." The working fluid is then cooled through a regenerative heat exchanger, and water is separated from it to create a CO2 stream, which is pressurised and recycled back to continue the cycle. The plant can operate on both water-cooled and air-cooled systems for cooling purposes. The excess CO2 is a pipeline-ready CO2 byproduct, which will be supplied to third parties for enhanced oil recovery (EOR) or sequestered underground. The only other byproduct from the power plant is water. According to the JV agreement, CB&I will provide engineering, procurement and construction (EPC) services for the project, while 8 Rivers will provide continued technology development and the technology licence for the project, and Exelon will provide operations and maintenance services for the demonstration plant. Toshiba is expected to start the supply of the supercritical CO2 combustor and turbine system in August 2016. The company has been working in collaboration with Goodwin Steel Castings for the project. The contract for the supply of the recuperative heat exchangers has been awarded to Heatrice. As part of the contract, the company will supply four of its proprietary printed circuit heat exchangers (PCHEs).